Software components are intended for composition “as-is” without the intention to modify them in source-code. 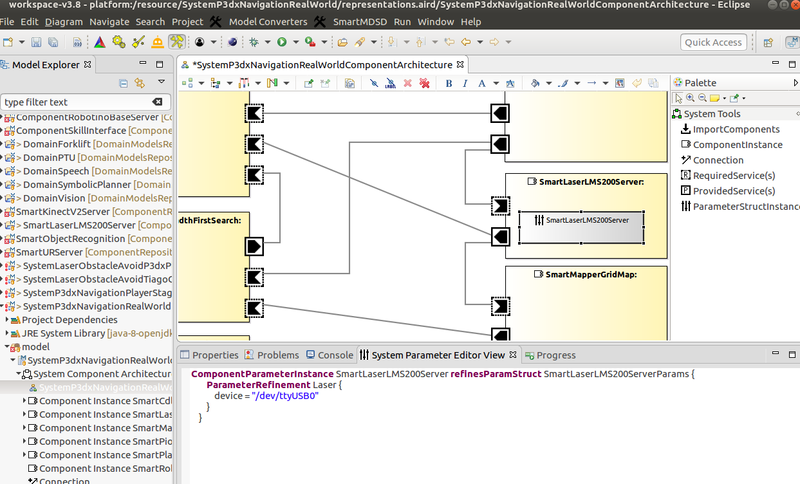 The SmartMDSD Toolchain foresees “component parameters” to configure foreseen variation points. Parameters are defined in Tier 2 as re-usable domain models or within a software component. Their values can be customized durin system composition. This page will describe the steps to setup a component with parameters. We will configure the component parameters in a component project and will customize it during system composition. They can be re-used by multiple components. Use this if you want to provide a general way to parameterize a variety of software components (composability). These parameters are specific to one component. No re-use of a parameter definition by another component. Double click on ComponentParameterConfigParam to get code window. Add variables with datatype and initial values. Create an instance of your component.